After attending several RV shows and joining you for a few RV Doctor seminars, my wife and I have purchased a Fifth Wheel (a 2010 Peterson Excel Winslow. We are very happy that we did our homework and now have a high quality RV that will hopefully last many years. My first maintenance related question is electrical. I have purchased a Progressive Industries 50-amp surge protector that plugs in at the pedestal and has a digital readout of voltage, amps being used, cycles and error codes. 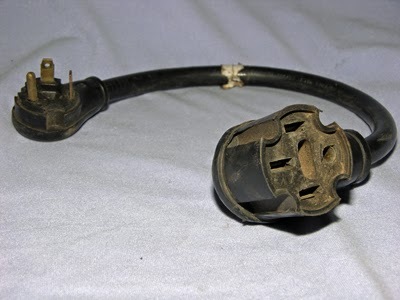 It will trip the power to the RV if power has the wrong polarity, and has several other features to protect the RV. At the Seattle RV show, you said it was a necessity to have a non-contact proximity tester, but with my surge protector, I think I am covered. Please confirm. I will probably pick up a Fluke volt meter for general usage. Mark & Cindi, the Progressive surge protector is a very good device and is certainly recommended for serious RVers. What we have found, however, is that neither the Progressive nor the Surge Guard models can protect against the dual fault situation called Reverse Polarity/Bootleg Ground (RPBG). It has been well documented by my buddy, Mike Sokol. Check out how and why the RPBG situation can even fool expensive ground loop impedance devices and those inexpensive three-light testers that everyone relies on; read this article carefully and be sure to click on the internal links! The only sure-fire way to verify the polarity of incoming voltage from a campground pedestal, and the most logical and safest for RVers, is the use of a non-contact voltage proximity test device. I consider it cheap insurance....that might just save your life.